Daniel O’Donnell may not be sitting on top of the U.S. charts at the moment, but he is, without a doubt, one of the most well-known performers in the world. From his humble beginnings in Ireland, Daniel has built a large and devoted fanbase ever since he released his first record three decades ago. And while he has managed to sell over 10 million albums over the years (yes, 10 MILLION! ), it is his live show that has helped him become a household name in his home country, the UK and elsewhere. His music - a smooth blend of classic Country, Easy Listening, Gospel, and traditional Irish Folk music - has attracted an audience that spans generations and includes everyone from children to grandparents. He was awarded an honorary MBE in 2002 for his services to the music industry. In 2012, he was acknowledged as the first artist to have a different album in the UK charts every year for 25 consecutive years. In the UK charts alone, he’s had 20 Top 40 albums and 15 Top 40 singles. Needless to say, Daniel O’Donnell has made his mark in the music business. While he may not act like it, he is a true superstar. With his wonderfully expressive tenor voice, Daniel eschews elaborate stage sets in favor of an intimate and warm live environment in which he is able to easily connect with his audience. Although he is the focal point of the show – front and center – he proudly features his longtime band in the spotlight rather than hiding them in the shadows. He maintains an ongoing professional relationship with Irish vocalist Mary Duff with whom he often performs with in concert. With his charismatic and down-to-earth stage presence, Daniel is an entertainer of the highest order. While close-minded Rock fans may balk at his clean-cut image and lack of ‘street cred’, they are missing the point entirely – Daniel has created a body of work that ‘touches’ his audience. He didn’t set out to become one of the most popular Irish performers of all-time: he set out to entertain and his longevity in the business is proof that Daniel has achieved that goal many times over. 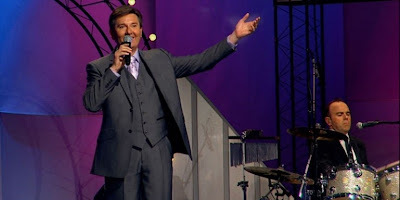 Apart from his successful tours, Daniel has also spent time performing limited engagements in Branson, MO, where he has made quite the impression and is fast becoming a Branson favorite. In late 2012, Daniel performed a show at Iowa Public TV which was recorded for PBS. That show, From The Heartland, is a mix of fan favorites and features songs not included on his previously released DVDs including “Distant Drums” and “Farside Banks Of Jordan.” He even pays tribute to former Iowa native Andy Williams, who had passed away shortly before the taping (a lovely and all-too-brief rendition of “Moon River”), and his singing idol Loretta Lynn (“Standing Room Only”). With his faithful band at his side plus the lovely Mary Duff making an appearance, From The Heartland is a loving tribute to classic Country as well as his Irish roots. 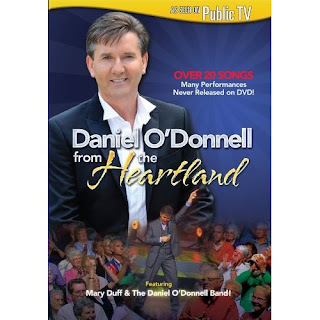 Now available on DVD and CD, From The Heartland is Daniel O’Donnell at his finest. DANIEL O’DONNELL: Well, I’ve enjoyed it immensely and I’ve been very fortunate. SPAZ: From The Heartland, getting played on PBS, now available on DVD and CD, how are you feeling about how this special has been received and sort of the reaction to it? DANIEL: Well, very good. We’ve really had a very positive reaction to it and I think as we’ve gone throughout the years, we’ve managed to have a very good relationship with PBS and our audience. SPAZ: Now, Do you feel particularly close to any of the songs – because I felt like there seemed to be a real connection with songs like “When You Were Sweet Sixteen” and I felt the performance of “Moon River” was really emotional, especially coming right after the death of Andy Williams? DANIEL: Yes, well you know, we were In Iowa where Andy was born. You know, over the past number of years I got the opportunity to meet Andy a few times and we always went to his show because we do shows in Branson, Missouri every year. At that point in time I knew that we were going to be moving to his theater this year in Branson. Before he had passed away we had a fairly good idea that we were going to move to his theater. It just seemed like the right thing to do on that show, you know, just to honor him in some way. Although I didn’t know him very well, I always enjoyed his performances and enjoyed meeting him anytime I got the opportunity. Of course songs like “When You Were Sweet Sixteen” - I sing a lot of different types of songs, but the ballads, I suppose, are very much what I grew up with, you know, the story songs, so it’s very comfortable for me to sing songs like this. SPAZ: Most of the band, you know you were talking about earlier about the band, and most of the band has been with you for at least 20 years. Now, that’s probably twice the length of time that most rock bands actually are in existence. What do you owe the longevity to? DANIEL: Well, we’ve been together a long time. Four of us are together for 27 years, since 1986, and then the others have been over 20 years. I think we’ve enjoyed a great deal of success and we had a combined goal, even though I was the leader of the band or the lead singer, they were very supportive of me, and that was a great thing. I think that we respected one another through the years in everything that we have done. We have a good bond, you know, as people as well as musically, so I just think we were very fortunate, I use that word a lot - very, very blessed to be able to do something that we enjoy so much and to have been able to stay together for so long. SPAZ: Yeah, you met Mary Duff about 25 years ago. How did that come about? DANIEL: Well, prior to my doing concerts, in Ireland there’s a great culture of dances and at that time a lot of places we did were dance halls, you know, and shows where people danced. When we started looking at other concert situations in 1987 we put together our first tour of the United Kingdom. My manager, Sean, who has been my manager since the beginning of ’86, we talked about it and we said, well, we need somebody to open the show. He had met Mary at a talent competition where he was a judge, and she had won the competition, and he said she is a great singer. She came to one of our shows, prior to the show she sang, and she was and is a great singer, and we did that tour together. Immediately we seemed to get along together. We didn’t sing together for a number of years. It was about 1994 before we sang together, a duet, but we’ve had a wonderful singing partnership as well as you know, the independent stuff that we do on the show. We’ve got a wonderful duet thing going there too, and she is a lovely girl, Mary. You know, she is a very agreeable person and contributed greatly to the show. She’s a big part of it. 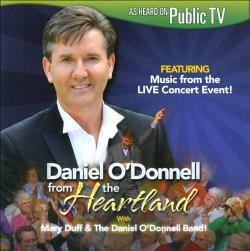 Watch Daniel O’Donnell From the Heartland - Preview on PBS. See more from PBS Specials. SPAZ: There was one song in particular I think that sort of stuck out a little bit to me and that is “Rivers Of Babylon.” I mean, obviously it was, I believe, derived from a biblical psalm, but it became a huge Reggae hit and then even bigger hit for Boney M. What sort of gave you the idea to bring it back to its Gospel roots, because it has a very Gospel feel to it that the other versions don’t? DANIEL: Well, I enjoy the Gospel music myself and like a lot of singers, I suppose, my first singing was done in church and the Gospel music I do, of course, is very much the Country sort of Gospel. I’ve recorded a couple of albums of Country Gospel. The most recent one was Peace In The Valley. I suppose I just like that sound. I like the sound of the Gospel and it’s a great song. It’s very emotive, too, and it’s a great story. It’s nice to do these songs. And I suppose nice to, that you know, in a situation where you are singing with a huge audience and yet there’s that religious side to it, too. SPAZ: The show, it just has this very warm and inviting feeling. How much prep goes into one of these shows? DANIEL: Well, we rehearse quite a bit to put the show together. I suppose the one thing that I think is important is the connection with the audience. The audience is a very important part of what we’re doing and that’s one thing that I’ve been really pleased about throughout my career - I’ve been able to meet people, interact with people, both from the stage and off the stage, and it’s made what I’m doing of greater value than it could ever be in monetary terms. 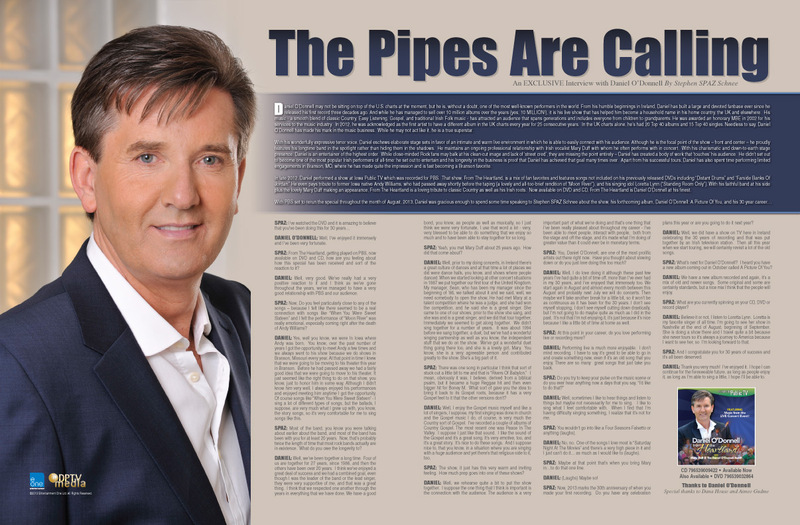 SPAZ: You, Daniel O’Donnell, are one of the most prolific artists out there right now. Have you thought about slowing down or do you just love doing this too much? DANIEL: Well, I do love doing it although these past few years I’ve had quite a bit of time off, more than I’ve ever had in my 30 years, and I’ve enjoyed that immensely too. We start again in August and almost every month between this August and probably next July we will do concerts. Then maybe we’ll take another break for a little bit, so it won’t be as continuous as it has been for the 30 years. I don’t see myself stopping, I don’t see myself cutting down drastically, but I’m not going to do maybe quite as much as I did in the past. It’s not that I’m not enjoying it, it’s just because it’s nice because I like a little bit of time at home as well. SPAZ: At this point in your career, do you love performing live or recording more? DANIEL: Performing live is much more enjoyable. I don’t mind recording. I have to say it’s great to be able to go in and create something new, even if it’s an old song that you enjoy. There are so many great songs that just take you back. DANIEL: Well, sometimes I like to hear things and listen to things but maybe not necessarily for me to sing. I like to sing what I feel comfortable with. When I find that I’m having difficulty singing something, I realize that it’s not for me. SPAZ: You wouldn’t go into like a Four Seasons Falsetto or anything (laughs). DANIEL: No, no. One of the songs I love most is “Saturday Night At The Movies” and there’s a very high piece in it and I just can’t do it… as much as I would like to (laughs). SPAZ: Maybe at that point that’s when you bring Mary in…to do that one line. SPAZ: Now, 2013 marks the 30th anniversary of when you made your first recording. Do you have any celebration plans this year or are you going to do it next year? DANIEL: Well, we did have a show on TV here in Ireland celebrating the 30 years of recording and that was put together by an Irish television station. Then all this year when we start touring, we will certainly revisit a lot of the old songs. SPAZ: What’s next for Daniel O’Donnell? I heard you have a new album coming out in October called A Picture Of You? DANIEL: We have a new album recorded and again, it’s a mix of old and newer songs. Some original and some are certainly standards, but a nice mix I think that the people will enjoy. SPAZ: What are you currently spinning on your CD, DVD or record player? DANIEL: Believe it or not, I listen to Loretta Lynn. Loretta is my favorite singer of all time. I’m going to see her show in Nashville at the end of August, beginning of September. She is doing a show there and I travel quite a bit because she never tours so it’s always a journey to America because I want to see her, so I’m looking forward to that. SPAZ: That’s awesome. Well, I certainly appreciate your time…. DANIEL: My pleasure, thank you. SPAZ: And I congratulate you for 30 years of success and it’s all been deserved. DANIEL: Thank you very much! I’ve enjoyed it. I hope I can continue for the foreseeable future, as long as people enjoy it, as long as I’m able to sing a little, I hope I’ll be able to.